Once a part of science fiction, IoT is now a bigger reality, ready to make our lives simpler. A healthy developer ecosystem is the base for a successful IoT platform and the world market will be much bigger than the ‘5 computers’ that Thomas Watson predicted in 1943 with a big innovation like IoT. Internet of Things (IoT), which was once a part of science fiction is now a reality. Vendors and customers are getting ready for the next big revolution, which makes everything around them, from streetlights to seaports ‘smart’. True potential of IoT is beyond the innovations in a four-inch phone device or fancy wrist watches and gadgets. IoT is going to change the way we interact with different things and creating this change is impossible without developers. The Hi-Tech Practice Team of Blueocean Market Intelligence has got together to create an analysis on the topic and a complete whitepaper was released by Analyst Linshida Iqbal and market research manager Palaniranjan Shanmugakani. The analysis is an overview of developers’ importance in the IoT ecosystem, emphasizing the role played by developers and their perspective on various factors related to IoT development. It also talks about the opportunities and challenges that developers face and shares recommendations on how developers and players can be more successful in this market. We are entering a new era of technology that will encompass every aspect of our lives. A platform where objects, animals or people are given the ability to exchange data over a network, without requiring human to human or human to computer interaction might have sounded impossible a decade ago, but now it is a fact and we call it as Internet of Things (IoT). IoT consist of billions of smart and connected things which would result in useful actions that can simplify and improve the quality of life of consumers and productivity of enterprises. Heart monitoring implants, refrigerators that remind us to order groceries, automobiles with built-in sensors or any other object that can be assigned an IP address and give the ability to exchange data over a network are the various devices that can refer to the ‘things’ in IoT. IoT will create an impact on not just one sector, but on every imaginable sector like agriculture, retail, manufacturing, energy, security, disaster management, healthcare, etc. We will see intelligent factories and farms, intelligent highways and vehicles, power grids, intelligent utility, smart home, connected cars etc. These benefits do not even come close to listing all the ways in which IoT will impact us. IoT is primarily driven by connected devices. We will soon witness a great increase in the number of connected devices and it is said that a minimum of 2 connected “things” will be there for every person living on earth, by 2020 (IoT Analytics). Perhaps, IoT is the biggest technology trend among all the other technology trends taking place now and it is expected to spread rapidly over the coming years. Creativity of this new era is infinite and it has massive potential to improve our lives. It is interesting to note that Industry experts are pretty confident about the revolution we might witness because of IoT. Developers have come a long way starting from Mainframes application development in 1960’s to IoT development in 2013. Though their solutions were initially targeted for the enterprise market, eventually they started serving the consumer space as well. We have witnessed innovations and revolutions over the period and their solutions have become so essential to both our working and daily lives. Developers play a crucial role in making any technology succeed in the market as they are the ones, who develop innovative solutions using the technology. For instance, growth of smartphones was predominantly because of the increased demand for mobile applications and developers played the key role in creating this demand and growth. The demand for new and innovative mobile apps started rising, which created huge opportunities for developers and the smartphone industry flourished with the developer’s support. It is the same story when it comes to IoT market, where developers are the ones, who turn the market upside down. Developers create various IoT solutions and build value for the IoT devices by creating a whole new user experience, which makes developers the heart of IoT ecosystem. Like the demand for smartphones were increased by apps, the demand for IoT will be driven by developers coming up with new and interesting IoT solutions. Unlike smartphone industry, where consumer market was the primary target of developers, IoT developers are showing high interest towards business market. Smartphones were closely connected to consumer segment, but IoT solutions that directly connect to consumer space are limited to a few verticals like wearables. Conversely, business market has plenty of options like industrial IoT, intelligent highways and vehicles, smart buildings, intelligent factories, etc. Developers are currently working on business productivity and customer engagement solutions especially in the manufacturing, health care, retail and transportation sectors. Big data, real-time engagement, cheaper & greener manufacturing, remote mobile device management, connected cars, smart homes, etc. are the few changes we might see in the coming years because of IoT. IoT devices can help enterprises to increase revenue and sales while decreasing inefficiencies. Hence, the growth potential of business market is larger than in the consumer market for IoT solutions. "IoT is crossing over from consumer gadgets to business productivity and customer engagement. In the consumer space, individuals connect to the IoT typically through a single personal mobile device, with the IoT experience encircling the user. However, with business solutions IoT includes users and encircles the business and enterprise assets. 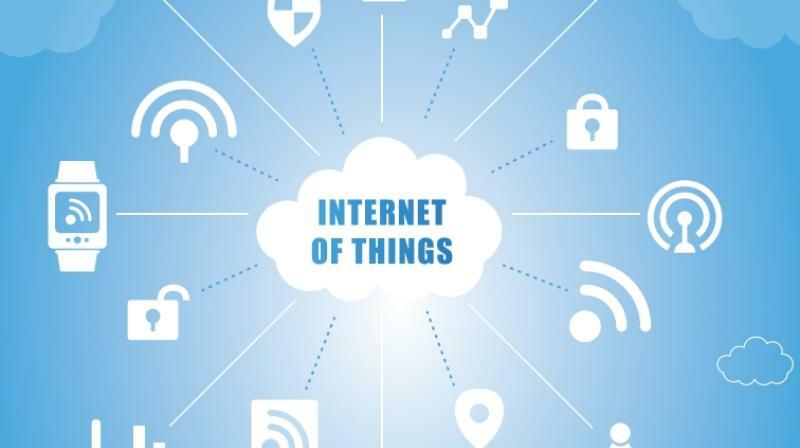 The IoT connected applications developers build for the enterprise are essential to connect the disparate parts of a distributed IoT business solution, from mobile devices, wearables and sensors, to cloud and on premise enterprise back-ends. Software developers will clearly play a major role in driving IoT innovation and business adoption in 2015 and beyond,” says Michael Swindell, Senior Vice President of Products at Embarcadero Technologies. Smart home is the primary business vertical that attracts highest developer interest, where 32per cent of developers are already working on smart home solutions and another 35per cent of developers are planning to do so in the future. Retail is the next key business vertical targeted by IoT developers with 52per cent developers agreeing to it. 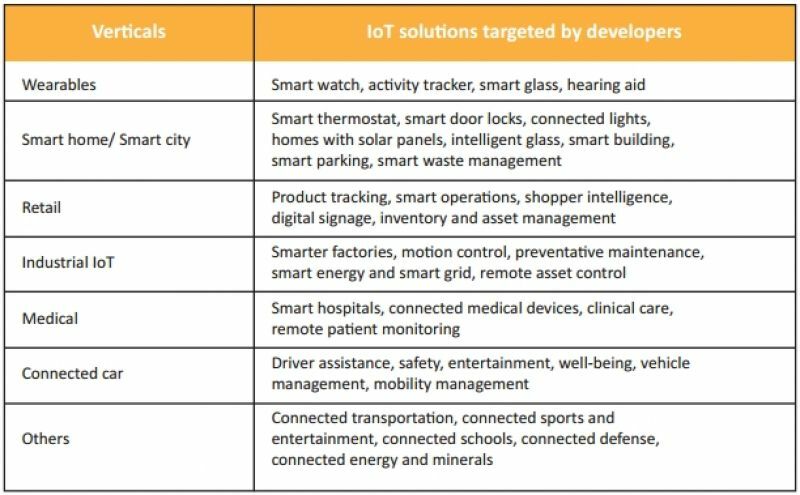 There are large number of IoT solutions emerging in the market under each vertical and developers are targeting these solutions and experimenting with their innovation. It looks like IoT market will soon become bigger than anybody could ever imagine with the developer-driven demand. Although many developers are building IoT solutions, 50per cent of developers are still in the learning and discovery phase according to IoT Developer Survey 2015 by Eclipse IoT working group. They are still figuring out what more innovation or new user experience they can bring to the IoT platform. Open source is completely critical to the success of IoT. Most of the developers are using open source software like Arduino Yún, Kinoma, Beagleboard, AllJoyn, Flutter, etc. for IoT solutions. The success of web and Internet is predominantly because of its fundamental building blocks being free and open. Open source components has encouraged people to explore and developers to experiment with the web and internet. Similarly, open source software will motivate developers to create more innovative IoT solutions without any hesitation. Developers agree that 90per cent of IoT devices will accept non-traditional input, such as sensors, GPS and line of sight, while another 26per cent will present information in non-traditional ways, such as virtual reality, haptic, audible and environment change, according to Embarcadero Technologies Developer survey. This indicates that developers are moving away from traditional touch input. At the same time, developers might face some challenges in creating solutions as they should have in-depth knowledge about each individual gadget they are connecting with, in order to provide the best solution. The best way to determine successful players in the IoT market is to look for those with highest number of developers. Although, large organizations like Cisco, IBM, Jasper, etc. seems to position themselves as leaders in the IoT market space, when it comes to developers, the real leaders are Apple and Google. Apple and Google have already started nurturing a high number of developers to use their emerging IoT platforms, such as smart home (Apple HomeKit, Nest Developer Program), wearables (Apple Watch, Android Wear) and connected car (Apple CarPlay and Android Auto) effectively. Developers are the new king makers, and we can clearly see that in the developing IoT market. IoT market is welcoming new developers actively and it is expected to have a developer population of 9.7 million by 2020 across the globe. However, the IoT developers’ community which has a population of 4.5 million today is expected to grow at a CAGR of 17per cent through 2020. The market needs millions of developers by 2020 in order to develop the market, which indicates that IoT market is going to witness plenty of more innovation and development in the coming years. Many developers from mobile app market are shifting to the IoT market. According to ‘The Commerce-of-Things’ by VisionMobile 2015, 53per cent of mobile developers have already entered the IoT market for making products, as a project or hobby in 2014, growing to 59per cent in 2015. The current trends show that mobile developers are going to play a major role in IoT market development by expanding their innovation beyond mobile apps. There is a noticeable difference regarding the concerns among developers, who have created a solution versus developers, who are planning to create soon. Security is a concern that has to overcome in order to avoid various threats in IoT and it is the major concern among IoT developers, according to VDC Research's polling 2015. The next major concern of IoT developers is interoperability. The risk of interoperability will increase as the future networks of IoT will have various services, many vendors and IoT solutions getting largely distributed. Certain standards have to be set both between and within domains, in order to avoid loss of important information or unavailability of some services. The lack of universal standards in the sector is the main reason for interoperability. Developers and device manufacturers create their own standards to ensure their solutions work and thus the technology from different solution provider will vary, since it does not have a standardized foundation. Either the Industry has to set universal standards for developers and manufacturers to create IoT solutions and ensure secure connections or create APIs that makes a common application layer framework, which would help IoT devices to communicate effectively, even if they are not built on a common standard. Other challenges that developers might face are IoT system integration and testing becoming complex and confusing, complexity in analyzing data, etc. Around 50per cent of developers are still in the learning and discovery phase as they are figuring out what more innovation or new user experience they could bring to the IoT platform. The wearables vertical attracts the most developer interest in the consumer space, which indicates that this vertical might soon witness innovation beyond Apple Watch and Android Wear. Apple and Google are seen as the real leaders in the IoT market since they nurture a large number of developers around their IoT platforms. Developers are planning to interconnect several IoT devices like mobile apps, desktop apps, cloud services, enterprise applications, etc. which soon will become the next big opportunity. Taking measures to protect consumer security and the interoperability of IoT devices has to be a priority for developers. There is a high level of excitement among developers, since the opportunities around IoT are abundant. IoT will create several opportunities in every sector from healthcare to manufacturing to retail and It will change the way customers interact with everything. Developers are lucky enough to create these amazing experiences and hence, they are extremely important for IoT to be successful. However, this charge shouldn’t be taken lightly. There are a few factors that developers and businesses should consider before implementing their ideas in the IoT market.